Step 1 Put the smoked cod in a deep frying pan. Add the bay leaf, then pour over the stock. Heat to simmering point, then reduce the heat, half-cover the pan with a lid and poach for 6-8 minutes until the flesh flakes easily when tested with the tip of a knife. (If you prefer, the fish can be cooked in a microwave.) Lift the fish out of the cooking liquid and set aside. Make up the volume of the cooking liquid/stock to 2 cups with water and reserve with the bay leaf. Step 2 Rinse out the pan, then add the oil and heat over a medium heat for a few seconds. Add the shallots and cook for 4-5 minutes until softened, then stir in the spices, followed by the rice. Stir for a few seconds to coat with the oil and spices, then add the reserved cooking liquid and bay leaf and the strip of lemon zest. Bring to a boil. Step 3 Reduce the heat to a gentle simmer, cover and cook for 10 minutes. Add the peas, cover again and cook for a further 5 minutes or until the rice is tender and nearly all the stock has been absorbed. Step 4 Meanwhile, flake the fish, removing any skin and bones. Reduce the heat under the pan to very low, then gently stir the fish into the rice together with the tomatoes, lemon juice and chives. 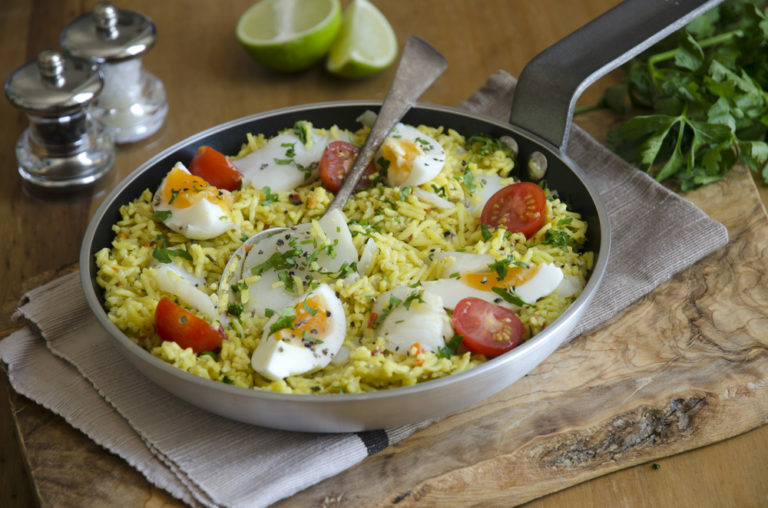 Step 5 Season to taste, bearing in mind that smoked cod is quite salty, then transfer the kedgeree to a warm serving dish and garnish with the egg quarters.